Here at Cymbiosis we provide a range of speaker cables from a variety of companies including Chord, Naim, Linn and QED. Finding the perfect speaker cable to match your system is critical to its overall performance, turning a good system into a truly great one. The cabling used in any system, especially the speaker cables, is a vital component in creating the ultimate Hi-Fi performance. 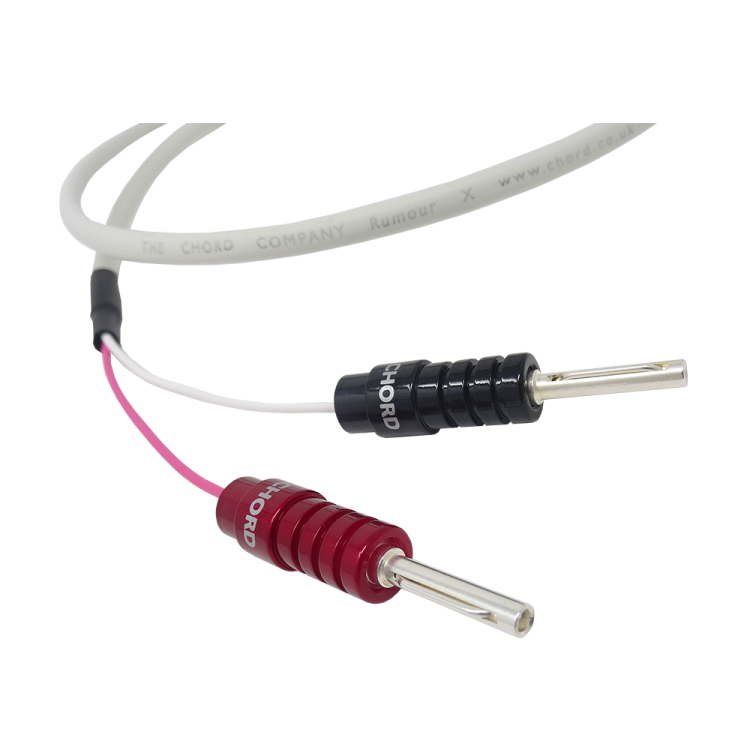 Due to each individual’s needs, most of our speaker cables are custom-made, taking into account length, termination and single, bi-wire or even tri-wire configuration. For the Chord Sarum Reference range please visit the Chord Sarum page. Chord’s Epic speaker cable is the result of a successful marriage of two award-winning speaker cables: Odyssey and Signature. The silver-plated, oxygen-free copper conductors, PTFE insulation and silicone surround are borrowed from the Odyssey cable and the shielding system is taken from the Signature. The development and success of Signature speaker cable proved conclusively that shielding speaker cables could bring some serious improvements to sound quality. The lessons learned during its development mean that Chord can now apply the same principles to other models within their speaker cable range. Fitting shielding systems to speaker cables can bring the same sort of benefits to the sound of a system as improving the shielding on interconnects. The reduction in the level of perceived noise means that very fine dynamic and tonal information is easily heard and this brings improvements not only to the high frequency performance of a system, but also the bass and mid frequencies. The lower noise floor also makes micro dynamic information easier to hear and it is simpler to follow, understand and become more involved with even the most complex pieces of music. The Chord Epic speaker cable is available in two varieties: Chord Epic Twin and the more advanced Chord Epic Reference, which moves performance quite a bit closer to Chord Signature. Chord Odyssey speaker cable shares its principal design features with Chord Rumour. Like Rumour, each conductor is made up of 19 strands of silver-plated, oxygen-free copper surrounded by PTFE insulation. However, the strands are of a heavier gauge and whereas Rumour uses 1.5mm overall diameter conductors, Odyssey uses 2mm overall diameter conductors. The larger diameter conductors help Odyssey to carry dynamic information extremely well and this produces real improvements to the weight, attack and dynamics of notes across the entire frequency range. Cymbals are noticeably more realistic and acoustic guitars and pianos more lifelike. This ability to carry dynamic information so well means that Odyssey produces a remarkably musical and coherent sound. When Chord Rumour was launched in 1996, it was one of the smallest speaker cables available (16 AWG). It sounded a lot bigger than it looked, it carried detail and dynamics really well and it was more coherent than just about any other cable around. As people got over the size and listened, rather than looked, it became a very popular cable. Apart from cosmetic changes it remained unchanged for many years. The size, the colour and the performance mean it’s still a popular cable. Chord Shawline shielded speaker cable shares the same conductors. Previous versions of Rumour speaker cables used PTFE insulation (often referred to as Teflon™) and until the arrival of Taylon®, this was the “go to” material. Although expensive, PTFE offered the best performance. Material technology is constantly developing and improving and alternatives to PTFE are now available. While the high cost of Taylon® prevents Chord from using this in all of their ranges, they were able to find a suitable family of insulation materials known as XLPE (Cross-linked Polyethylene). One version of this material looked particularly interesting and following listening tests, proved to be clearly better than the PTFE in Rumour speaker cable – now known as Rumour X.
NAC A5 is Naim’s multi-strand loudspeaker cable, consisting of two separated 4mm conductors. Its design is optimised for use with Naim amplifiers and any loudspeakers by ensuring that its capacitance, inductance and resistance are entirely compatible. We recommend its use along with Naim’s right-angled, twin loudspeaker plugs, which provide a safe, convenient and very effective connection for your Naim amplifier.